Mixed weather failed to dampen spirits as a record number of visitors attended the 2014 Colmore Business District (CBD) Food Festival, organisers have said. CBD estimates that around 26,000 people descended on Victoria Square for the fourth annual two-day festival which was hit by thunderstorms on the second day. A total of 24 cafés, bars and restaurants took stands at the event which aims to showcase the finest food and drink from around the area around Colmore Row. The body said the attendance was an increase of approximately 3,000 on the 2013 event with many venues reporting to have sold out their offerings by the time the second day was over. Seven different venues took to the stage on both days to perform cooking and cocktail making demonstrations with Harry Potter twins James and Oliver Phelps joining chefs Glynn Purnell and David Colcombe as sous chefs on the second day. 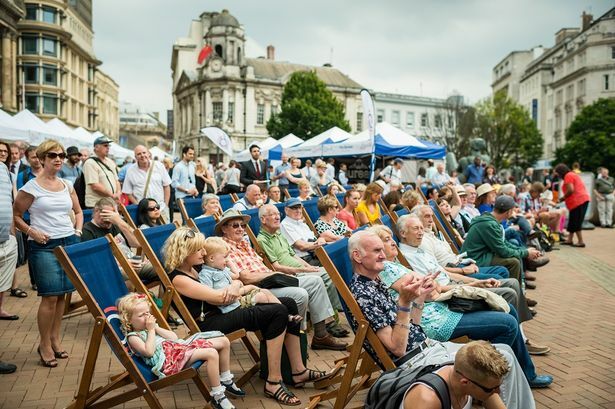 There were also performances from Birmingham Repertory Theatre&apos;s youth theatre company and acts from the Birmingham International Jazz and Blues Festival, magician Gavin Parsons, a &apos;juggling chef&apos; act and two stilt walkers. Ann Tonks, founding CBD board member and managing director of Opus at Cornwall Street, said: "This event started as a one-day pilot four years ago and has seen a big increase in visitor numbers each year. "This was the biggest and best CBD Food Festival we&apos;ve ever put on so to see another record crowd is testament to not only the good taste of Brummies but the quality of the hospitality venues in our district."